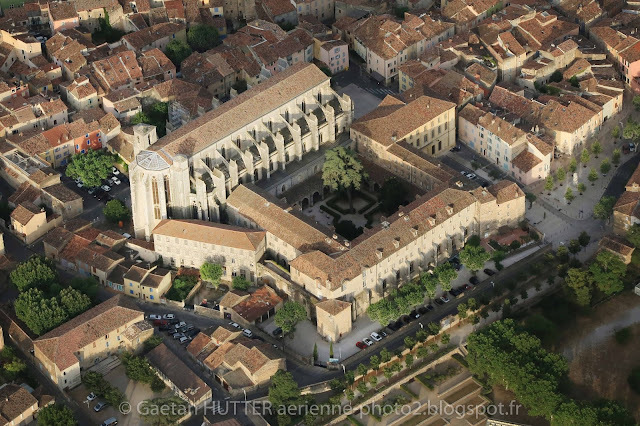 Baslica of Saint-Maximin-la-Sainte-Baume - is a town in south east France. It is located at the foot of the Sainte-Baume mountains: baume or bama in Provençal means "cave". The town's basilica is dedicated to Mary Magdalene. The little town was transformed by the well-published discovery on 12 December 1279, in the crypt of Saint-Maximin, of a sarcophagus that was proclaimed to be the tomb of Mary Magdalene. Charles II of Anjou, King of Naples founded the massive Gothic Basilica Ste. Marie-Madeleine in 1295; the basilica had the blessing of Boniface VIII. According to the legend, Mary Magdalene fled the Holy Land in a miraculous boat with neither rudder nor sail and landed at Saintes-Maries-de-la-Mer, in the Camargue area. She then traveled to Marseille and later on retired to a cave in the Sainte-Baume mountains. She was buried in Saint-Maximin. Construction of the basilica, began in 1295. The plague of 1348, killed half the local population and interrupted the construction work, which was resumed in 1404. Work continued until 1532, when it was decided to leave the basilica just as it was, without a finished west front or portal or bell towers.